This Oh It’s On Halloween Hiring At Party City appears immediately on the front doors. The Holiday Partying is most certainly on, and so must be the hiring if the Holiday fun is to be supported. The skull graphic is eye-catching and seasonal, but will need to be switched out for Thanksgiving, Christmas and beyond. 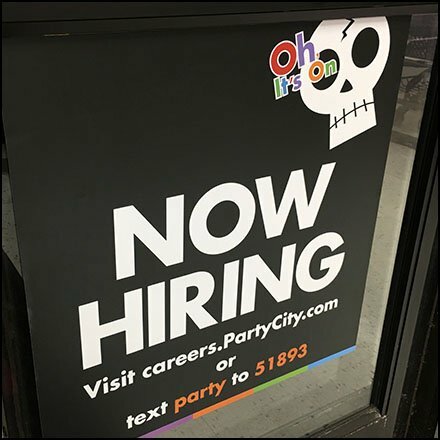 This Oh It’s On Halloween Hiring At Party City seen in Wilkes-Barre PA.